Compiled of five songs in total, the project bares one sole feature from T1. E. Ness kicks things off with the autobiographical “My Story”. He speaks on real life events over a soulful beat and even finds a way to pay respect to Biggie. Aside from classic styled rhymes, the Philadelphia artist also dabbles into a more modern flow as found on songs like “Touch The Ground” and “Mexico”. He closes the project out in true Bad Boy fashion with the braggadocios, Talk Heavy”. 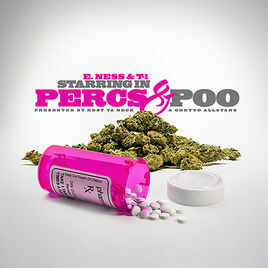 Presented by Ghetto Allstars and Rest Ya Neck, “Percs & Poo” is now available to purchase on iTunes and stream via Spotify. Check it out and stay tuned for a forthcoming video.